Visiting Sossusvlei and Sesriem Canyon will get you outdoors. Take a break from Namib-Naukluft Park with a short trip to Balloon Rides in Sesriem, about 1h 20 min away. 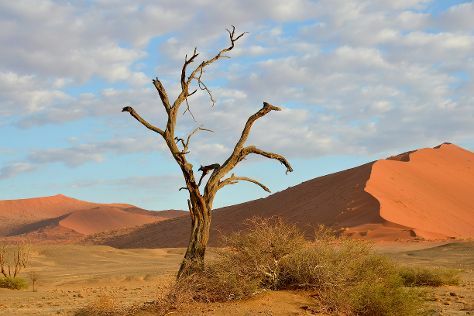 It doesn't end there: head outdoors with Deadvlei and admire nature's extreme beauty at Namib Desert. 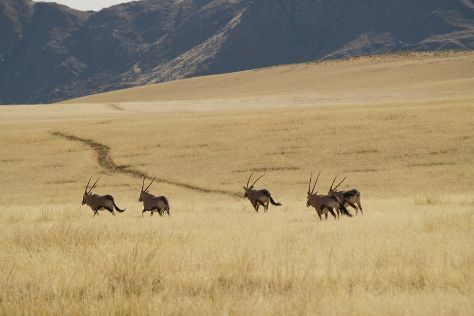 For ratings, photos, where to stay, and more tourist information, use the Namib-Naukluft Park travel itinerary creator. London, UK to Namib-Naukluft Park is an approximately 26-hour flight. The time zone difference when traveling from London to Namib-Naukluft Park is 1 hour. On the 20th (Tue), you'll travel to Luderitz. 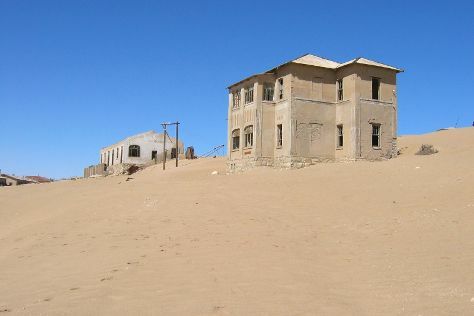 Get some cultural insight at Kolmanskop Ghost Town and Diaz Point. The adventure continues: admire nature's extreme beauty at Agate Beach, see the interesting displays at Luderitz Museum, steep yourself in history at The Goerke House, and pause for some serene contemplation at Felsenkirche. To see reviews, traveler tips, more things to do, and other tourist information, read our Luderitz vacation trip planner. Traveling by car from Namib-Naukluft Park to Luderitz takes 10 hours. Expect a daytime high around 23°C in June, and nighttime lows around 10°C. You will leave for Otjiwarongo on the 26th (Mon). 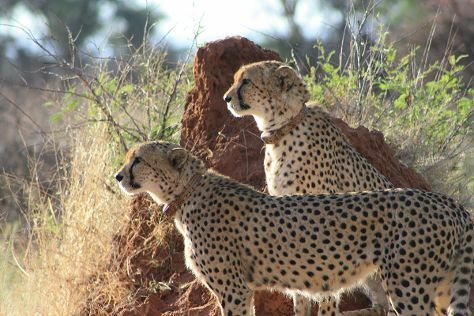 Take a break from the city and head to Cheetah Conservation Fund and Africat. Change things up with these side-trips from Otjiwarongo: Mundulea Nature Reserve (in Otavi) and Okonjima Game Reserve (in Waterberg Plateau Park). It doesn't end there: tour the pleasant surroundings at Waterberg National Park and get outside with REST - Rare and Endangered Species Trust. To see other places to visit, reviews, more things to do, and more tourist information, go to the Otjiwarongo travel itinerary creator. You can do a combination of flight and car from Luderitz to Otjiwarongo in 4.5 hours. Alternatively, you can drive. When traveling from Luderitz in June, plan for a bit warmer days in Otjiwarongo, with highs around 28°C, while nights are about the same with lows around 9°C. Wrap up your sightseeing by early afternoon on the 2nd (Sun) to allow time for travel to Etosha National Park. Etosha National Park is known for sightseeing. Your plan includes some of its best attractions: tour the pleasant surroundings at Etosha National Park, don't miss a visit to Okaukuejo waterhole, and contemplate the waterfront views at Lake Guinas. To find traveler tips, where to stay, other places to visit, and tourist information, read our Etosha National Park custom trip planner. Explore your travel options from Otjiwarongo to Etosha National Park with the Route module. You will leave for Kamanjab on the 8th (Sat). Kamanjab is a village of 6,012 people in the Kunene region in Namibia. Visiting Petrified Forest and Otjitotongwe Cheetah Park will get you outdoors. There's more to do: don't miss a visit to Otjikandero Himba Orphan Village and contemplate the long history of Rock Engravings at Peet Alberts Koppie. For more things to do, maps, traveler tips, and more tourist information, use the Kamanjab vacation builder. The Route module can help you plan travel from Etosha National Park to Kamanjab. You'll set off for Omaruru on the 13th (Thu). Omaruru is a city and constituency in the Erongo Region of Namibia. Get outdoors at Spitzkoppe and Messum Crater. Step out of Omaruru to go to Otjimbingwe and see Rhenish Mission Church, which is approximately 1h 35 min away. There's more to do: savor the flavors at Kristall Kellerei and soothe aching muscles at some of the top local wellness centers. For where to stay, photos, other places to visit, and more tourist information, read Omaruru itinerary builder. Traveling by car from Kamanjab to Omaruru takes 4.5 hours. On the 18th (Tue), you're off toWalvis Bay. Escape the urban bustle at Long Beach Leisure Park and Kayaking & Canoeing. 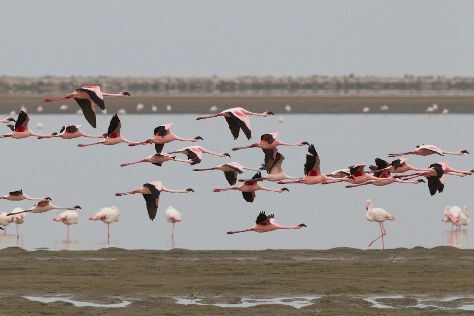 Explore Walvis Bay's surroundings by going to Swakopmund (Nature & Wildlife Tours, Die Muschel, & more). There's lots more to do: head off-road at local off-road trails, pick up a one of a kind souvenir at Peter's Antiques, take in the waterfront at Swakopmund Jetty, and look for all kinds of wild species at Dune 7. To find maps, other places to visit, traveler tips, and more tourist information, go to the Walvis Bay itinerary planner. Traveling by car from Omaruru to Walvis Bay takes 3 hours. Alternatively, you can do a combination of car, shuttle, and train; or do a combination of car and train. Expect a daytime high around 26°C in July, and nighttime lows around 11°C. Finish your sightseeing early on the 24th (Mon) so you can travel to Windhoek. Escape the urban bustle at NamibRand Nature Reserve and Fish River Canyon Nationalpark. Do some cultural sightseeing at Christuskirche and Katutura Township. And it doesn't end there: play a few rounds at Omeya Golf and Residential Oasis, browse the different shops at Maerua Mall, identify plant and animal life at Daan Viljoen Nature Reserve, and make a trip to Heroes Acre. For where to stay, ratings, reviews, and tourist information, read our Windhoek vacation planner. You can do a combination of flight and car from Walvis Bay to Windhoek in 1.5 hours. Other options are to take a bus; or drive. In July, daily temperatures in Windhoek can reach 26°C, while at night they dip to 9°C. Wrap up your sightseeing on the 29th (Sat) early enough to travel back home.